Oregon permanent cosmetic training is only open to licensed tattoo artists. We do not offer a pre-license program. But we can help you add the skills of permanent cosmetics to your service offerings. Sorry, no non-Oregon technician program is offered at this time. This continuing education course is 6 clinic days plus home study and practice in addition to class time. Depending on your background you may need to take additional training either with us or elsewhere. If you don’t have strong makeup skills, you may need training in brow design. People skills are a must. Black scrubs for the uniform. The training is offered in three segments spaced approximately one month apart. The balance of the hours is home-study. You are allowed 4 weeks to do your pre-study and then the first session is 2 days. You go home and practice your new skills on synthetic materials and stretching techniques on friends. The second session is 2 days and you start your hands-on work. You return home and continue to practice. The final session is 2 days to complete all procedures done in session 2. When you register and pay a $500 deposit plus the supply kit fee, we order and send you your training materials. Training supplies are not refundable. We schedule your first training session about four weeks out. This allows you pre-study time. The first session is 2 days. You go home and practice your new skills on synthetic materials and stretching techniques on friends. The second session is 2 days and you start your hands-on procedures. You must complete at least three procedures for each area you want certified in. The final session is 2 days to complete all procedures done in session 2. This is also time for review and answering any questions. Completing three procedures per area allows you to obtain insurance coverage. We will list them on your certificate. Completed procedures are those where you see the client on your following visit to see how the tattoo has healed and make any necessary adjustments. The $500.00 deposit plus the supply kit fee is paid upon enrollment. We order and send you your training supplies. This kit is non-refundable. $1500 is due at the commencement of the training class session one. $1250 is due at the commencement of training session two. The final $1250 is due at the commencement of training session three. 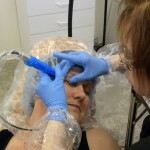 For Continuing Education classes for Permanent Makeup Technicians, please visit here.